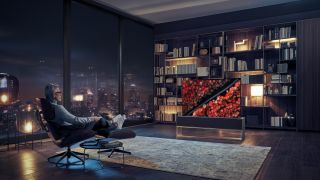 The brand-new OLED series will be available in a 65-inch screen size, called the 65R9, that can unfurl itself when you’re ready to watch a TV show or movie, and then roll itself back into its housing when you’re done. In addition to the Full View and Zero View modes (LG’s name for when the TV is fully unfurled and fully stored modes, respectively) there’s also a Line View mode that allows for just a portion of the screen to be unveiled. According to LG, the Line View mode is for features such as Clock mode to check the time and weather, Frame mode that displays family photos shared from a smartphone and Mood mode as well as displaying other features like music information and home dashboard. So how will the TV connect to game consoles, cable boxes and 4K Blu-ray players? LG hasn’t confirmed exactly what those will look like and how they’ll function, saving that tidbit for the show floor, but chances are good that those input and output connections will be on the back of cabinet in copious amounts. Inside the cabinet, the R-Series OLED will be powered by LG’s second generation Alpha A9 intelligent processor and, according to LG, uses LG’s deep learning AI for a four-step noise-reduction process. These technologies will pair with OLED's natural ability to produce deeper, darker black levels and better contrast. Like the rest of the range that was announced last week, the R-Series will be voice assistant-compatible with support for Amazon Alexa and Google Assistant. In addition to those, the R-Series will support Siri via Apple AirPlay 2 and HomeKit, making this one of the first TVs to support all three major smart platforms. Salivating just looking at LG’s rollable OLED? We don’t blame you. Unfortunately, however we’ll have to wait until later in the year to get it as LG has not yet announced a final release date or set price for the 65R9 - two details that will likely come in the second-half of 2019.